I was asked by The J.M. Smucker Company to create a springtime family treat. All opinions are my own. When I was kid I eagerly anticipated the day when we’d dye Easter eggs for the spring holiday. My brothers and sisters would gather around our pedestal kitchen table and make a colorful mess with mom overseeing the festivities. Although we had creative fun, I never liked eating the hard boiled eggs. 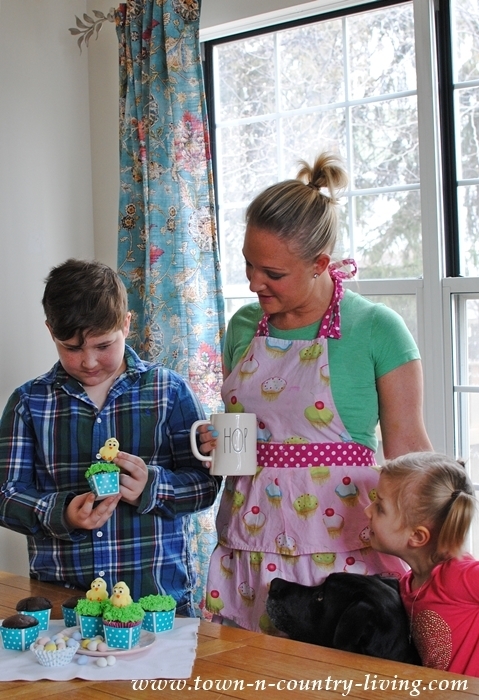 So this year, I thought it would be more fun to decorate Easter cupcakes with my family, which I know everyone will enjoy eating! 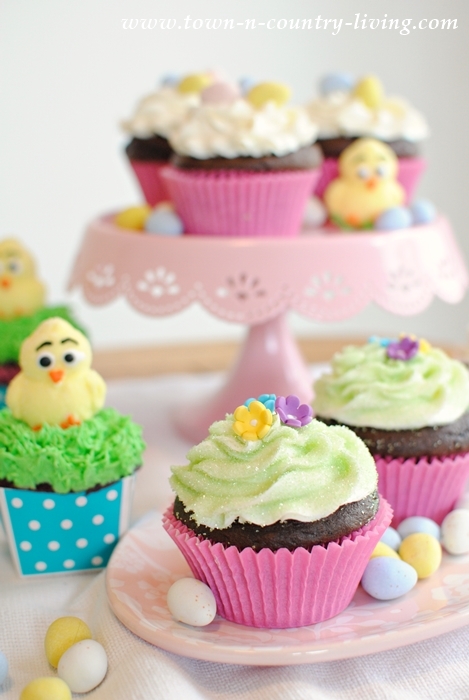 Honestly, don’t these colorful Easter cupcakes look more satisfying to eat than hard boiled eggs? 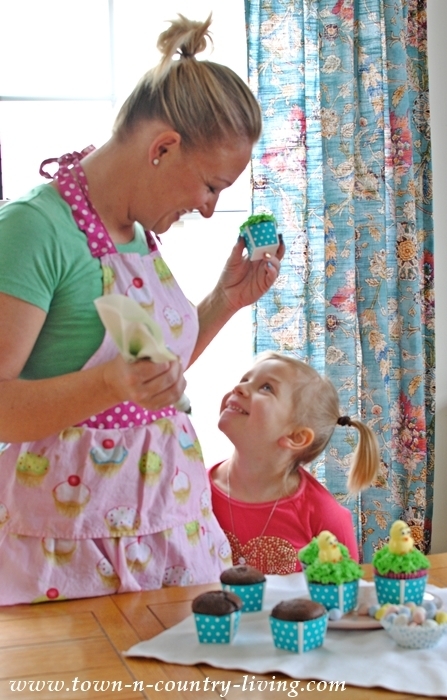 Your children or grandkids will have so much fun mixing up an Easter moment with you when they get to decorate cupcakes. 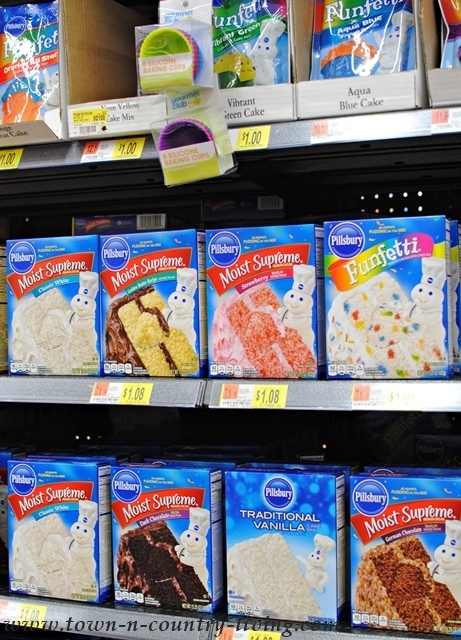 When shopping at Walmart, I decided to stock upon Pillsbury™ Cake Mixes. Funfetti is colorful and perfect for spring, but I chose Devil’s Food for this baking session. I did come home with several boxes and cans of frosting for future desserts, too. The cost is economical and using a boxed mix really saves time. My daughter Stephanie and I had her kids help us decorate the cupcakes after we finished baking them. We used both paper and cardboard cupcake liners. 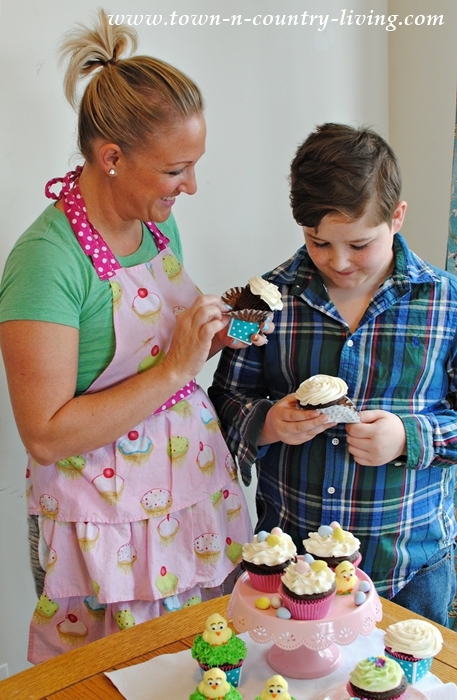 You can find lots of patterns and colors for your cupcake liners. 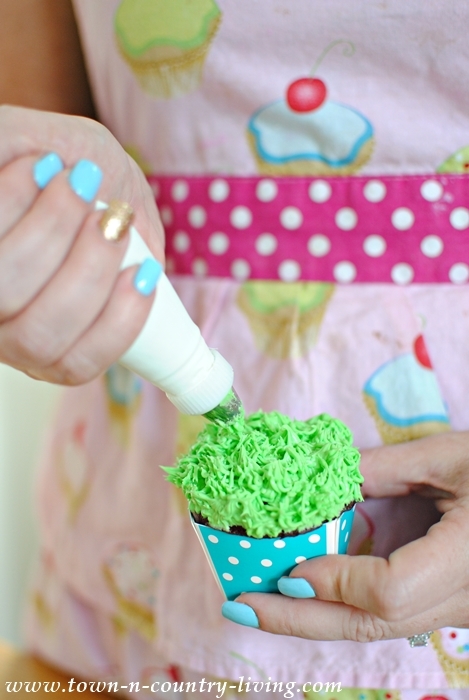 Stephanie demonstrates how easy it is to create “grass” with green-tinted frosting. We added a bit of green food coloring to Vanilla Pillsbury™ Frosting. You simply use a multi-holed decorating tip and squeeze out short tufts of grass. I knew the kids would have fun decorating the cupcakes, but I didn’t think the family dog would want in on the action. I’m sure Ammo was just hoping one of the cupcakes would fall on the ground. Zoe wanted her turn too. Mom frosted the cupcakes and the kids got to decorate them with chicks, eggs, and flowers. Tiny fingers actually come in pretty handy for placing tiny flowers. These were also sprinkled with pale green sugar. 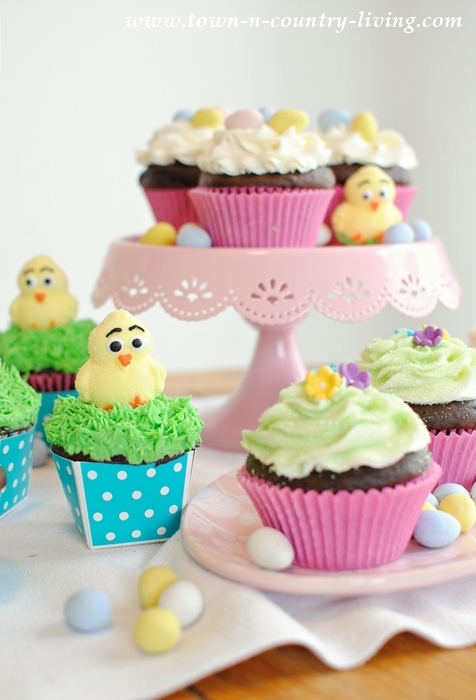 Of course, you have to have candy eggs on some of the cupcakes. I bought 2 bags of the mini eggs because I knew some would get eaten while decorating. Kids are pretty good at placing the decorations on top of the frosting. 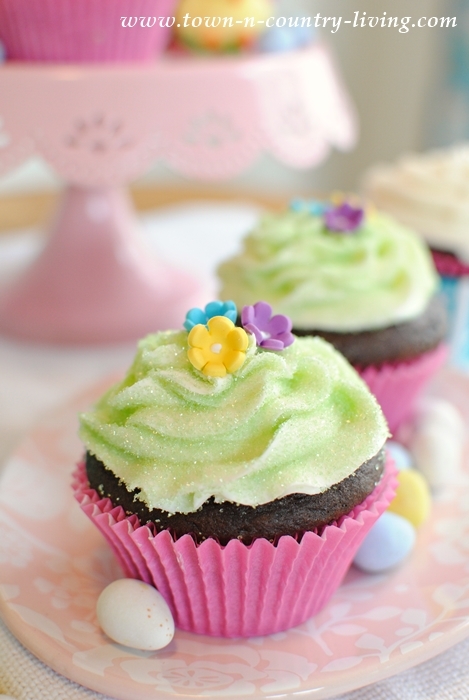 Eating the Easter cupcakes is probably the best part of an afternoon spent in the kitchen. 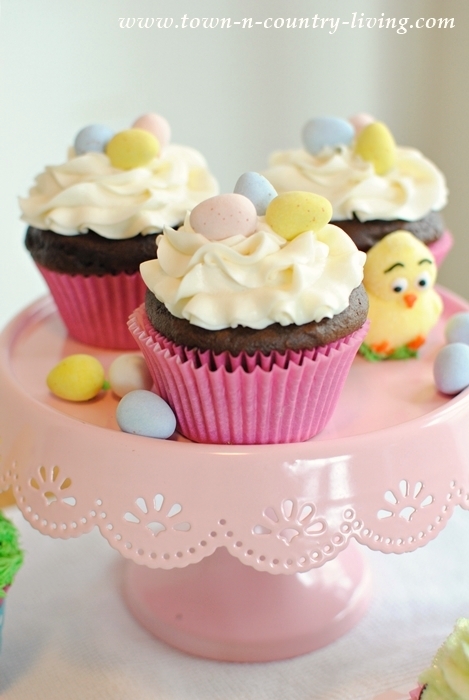 We’ve decided to mix up a moment each Easter by baking and decorating Easter cupcakes together. I’m sure this is a new tradition that will remain popular and will probably spread into other holidays as well. Discover more ways to #MixUpaMoment with cake mixes and be sure to stock up on your own supply of Pillsbury™ Brownie Mixes and Frostings with this handy money-saving coupon!